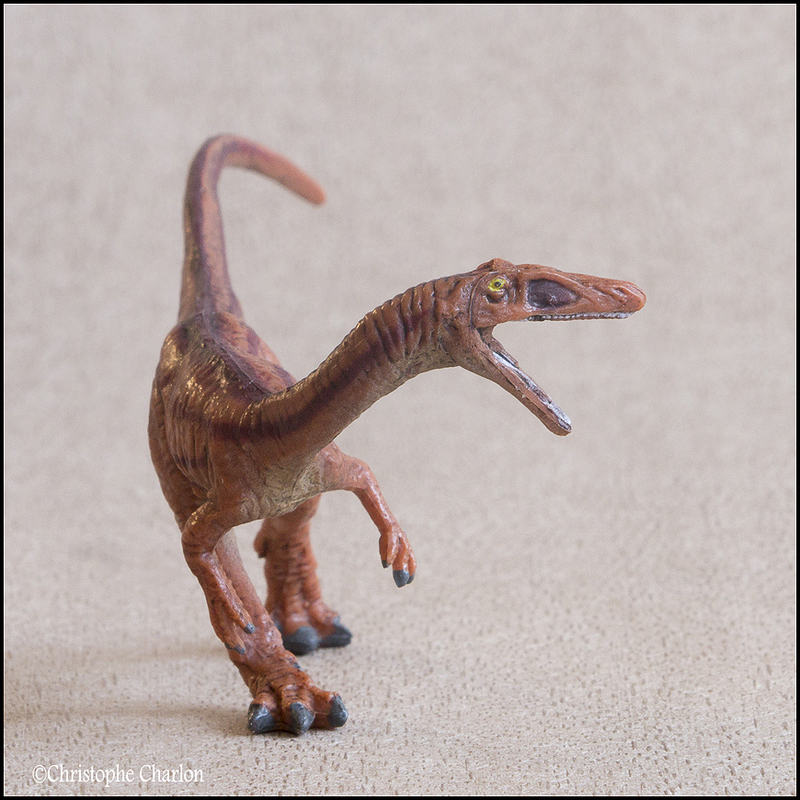 In 2016 Kinto favorite produced a series of ”dinosaurs sets” for the Fukui Prefectural Dinosaur Museum. With Halichoeres at the rescue I caught one of these sets to enjoy my poor displays. I’m happy and can’t resist to make another walkaround, I hope you will forgive me. 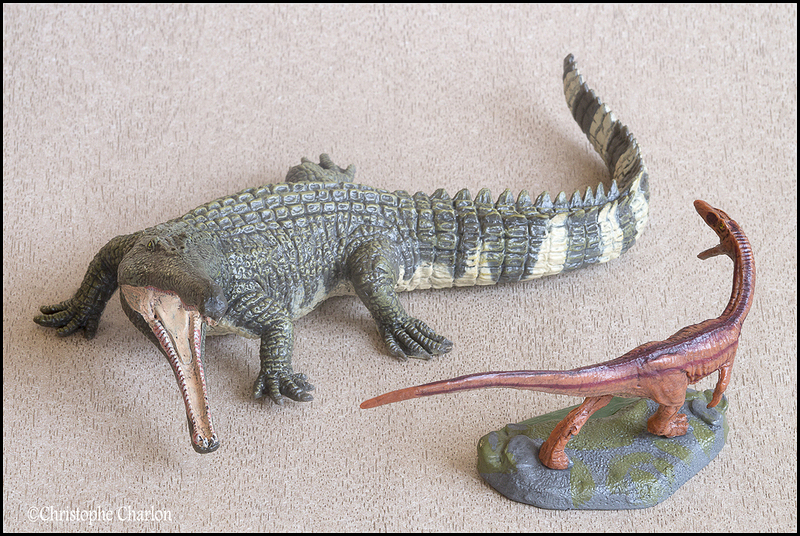 So let’s go to the late Triassic era, at a time when dinosaurs decided to take the first place on the show and Phytosaurs decided to say good bye. 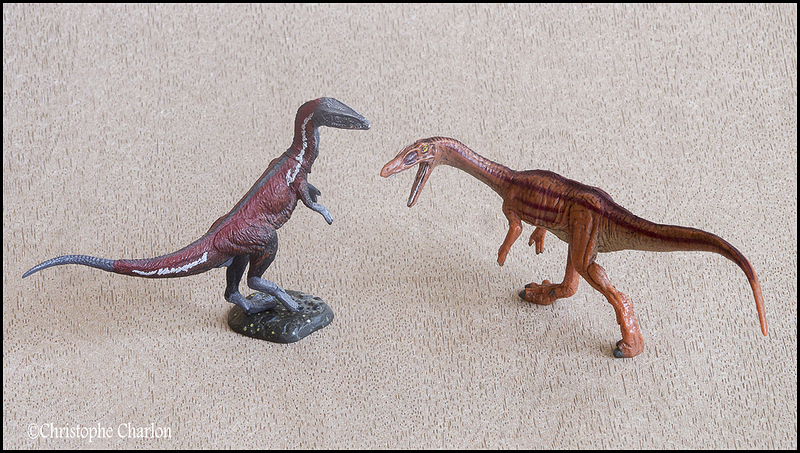 The set describe the”friendly” encounter of a Redondasaurus and a coelophysis. 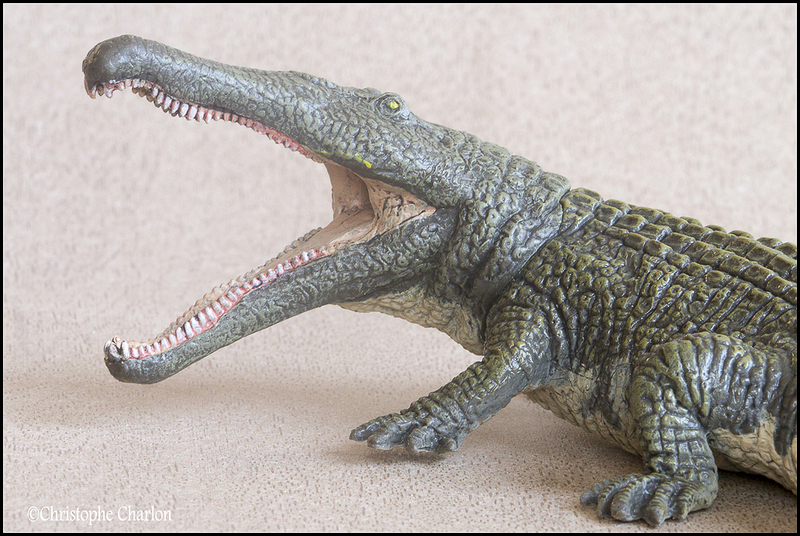 Redondasaurus was a 6 meter long Phytosaur, an extinct group of large, mostly semi-aquatic reptiles. 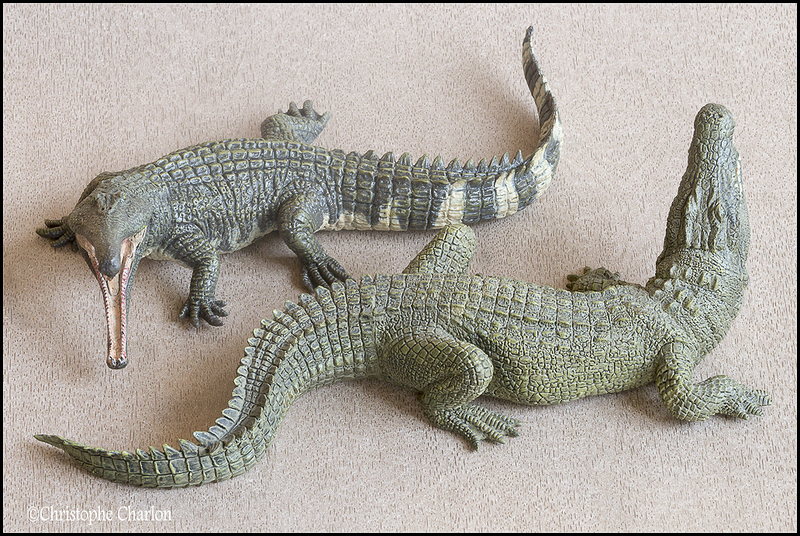 They were long-snouted and heavily armoured, bearing a remarkable resemblance to modern crocodilians in size, appearance, and lifestyle, as an example of convergence or parallel evolution. 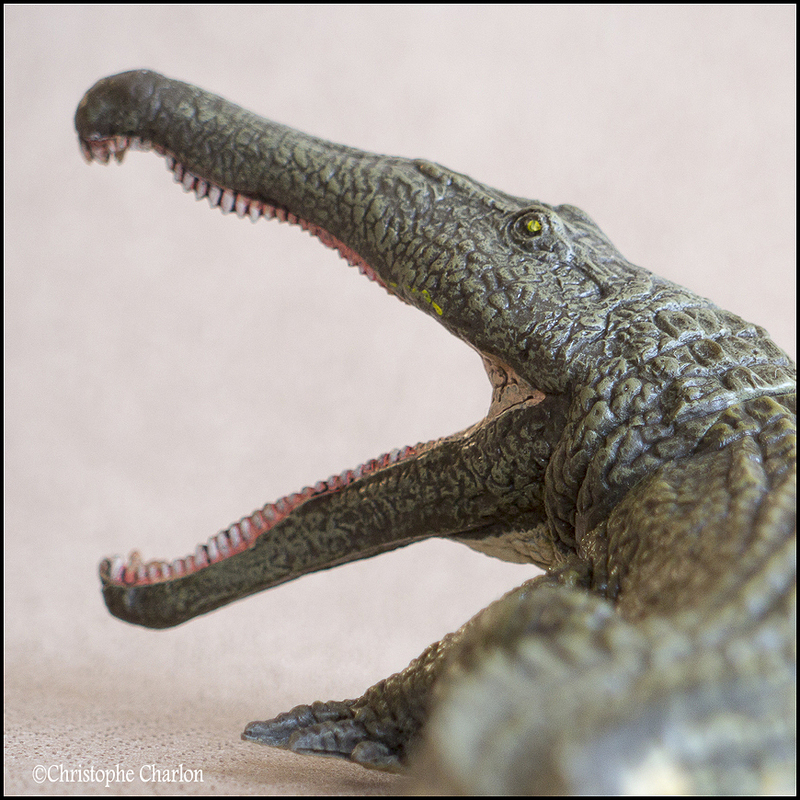 Despite similarities in appearance and lifestyle, there are still a few things that distinguish phytosaurs from crocodiles. 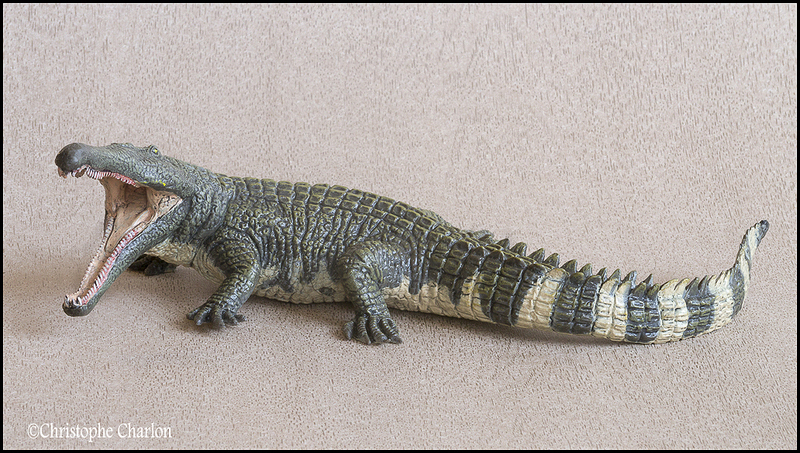 For one thing, the phytosaur ankle structure is much more primitive than that of any crocodile. 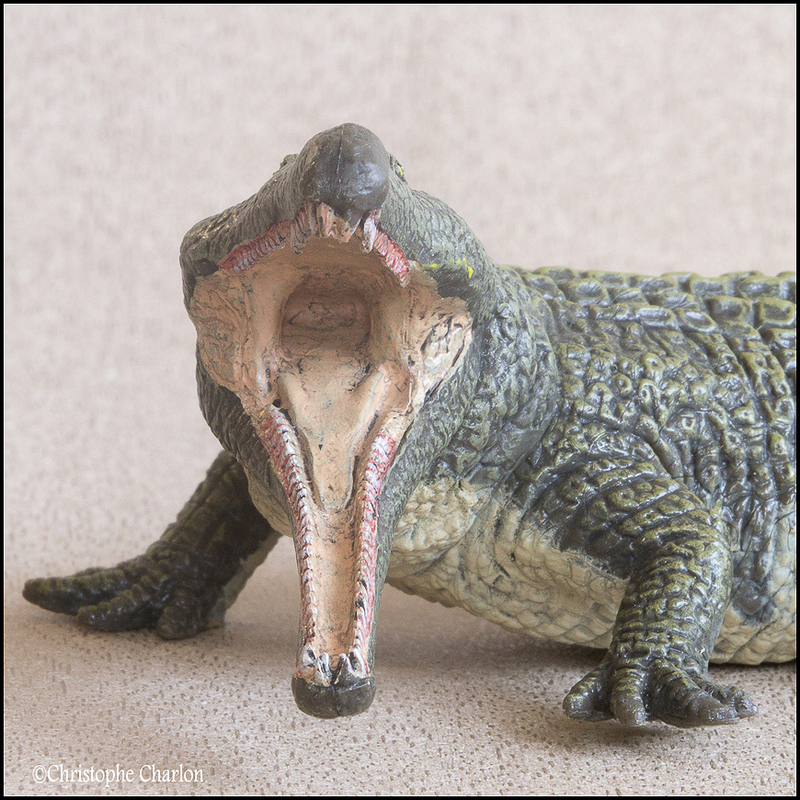 Also, phytosaurs lack the bony secondary palate that enables crocodiles to breathe even when the mouth has much water. 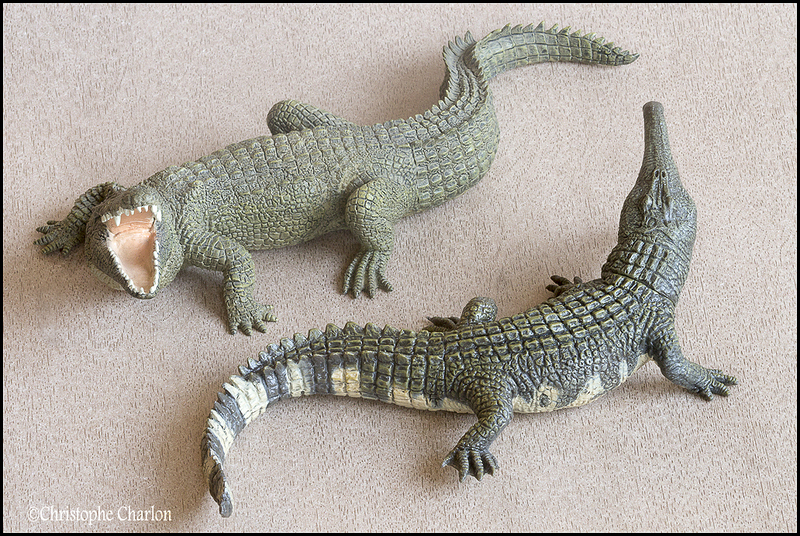 However, it is possible that phytosaurs had a fleshy palate, as many Mesozoic crocodiles are presumed to have had. 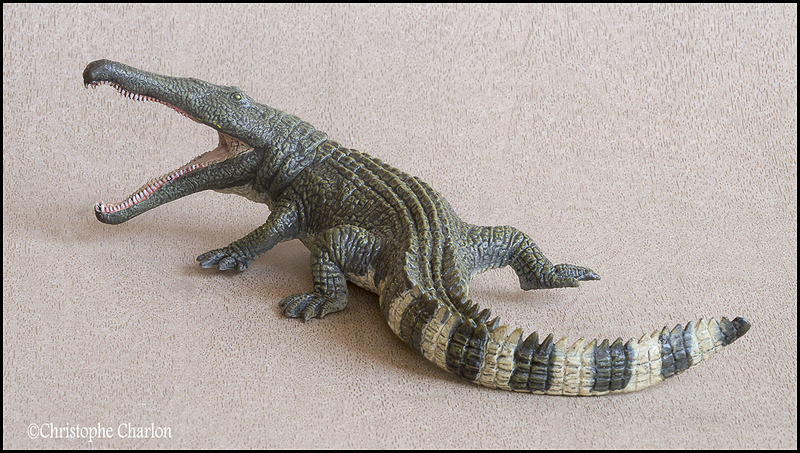 Phytosaurs were even better armoured than crocodiles, protected by heavy bony scutes (often found as fossils), and the belly reinforced with a dense arrangement of gastralia (abdominal ribs). 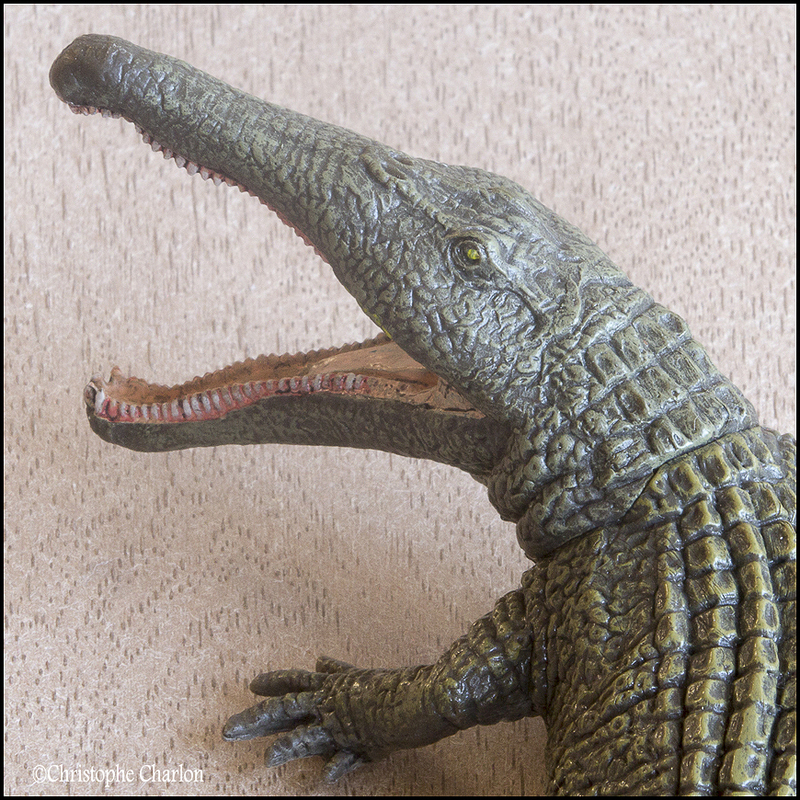 Finally, and most noticeably, phytosaurs had nostrils placed near or above the level of the eyes, in contrast to crocodiles where the nostrils are near the end of the snout. 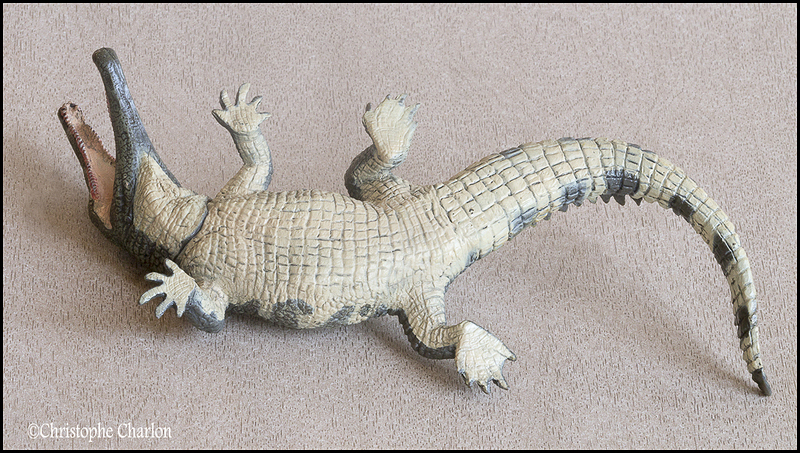 This adaptation may have developed to allow them to breathe while the rest of the body was submerged. 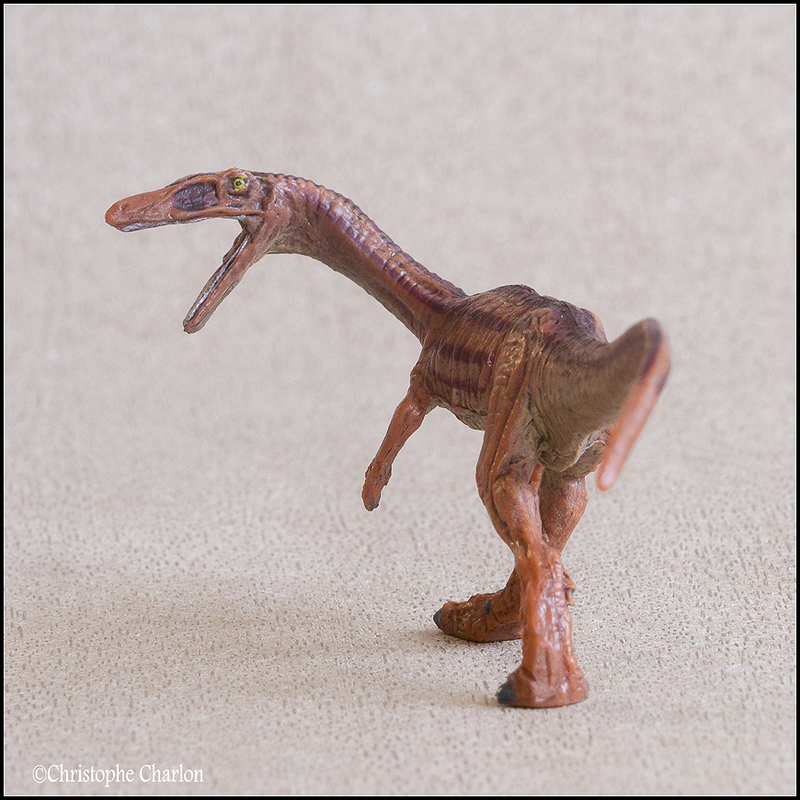 In contrast, Coelophysis was a small bipedal, carnivorous, theropod dinosaur that was a fast and agile runner. 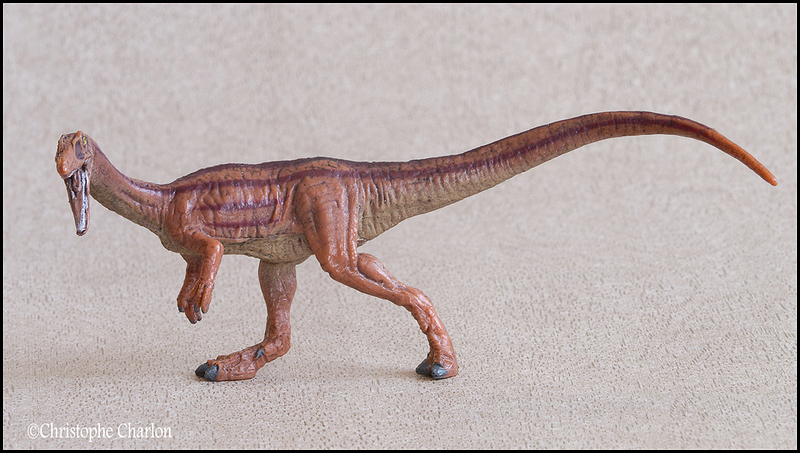 It was a lightly built dinosaur which measured up to 3 metres (9.8 ft) in length and which was more than a meter tall at the hips, with a weight between15 and 20 kg. 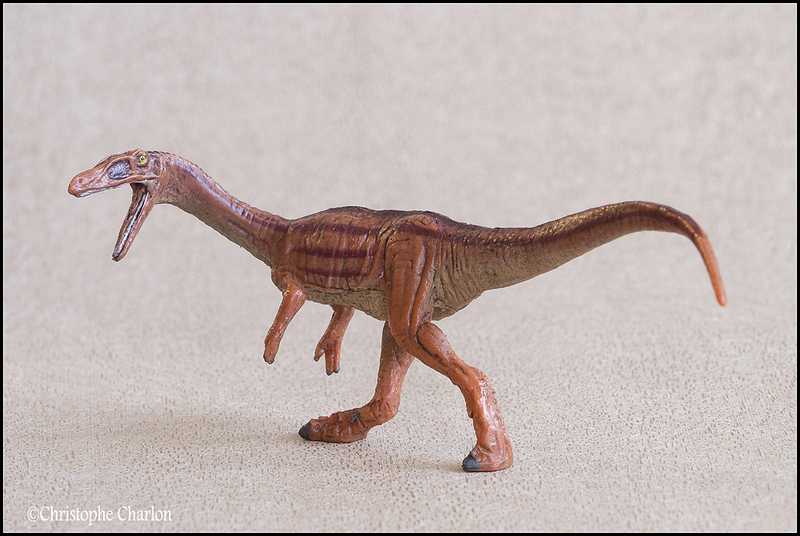 Coelophysis was one of the earliest known dinosaur. 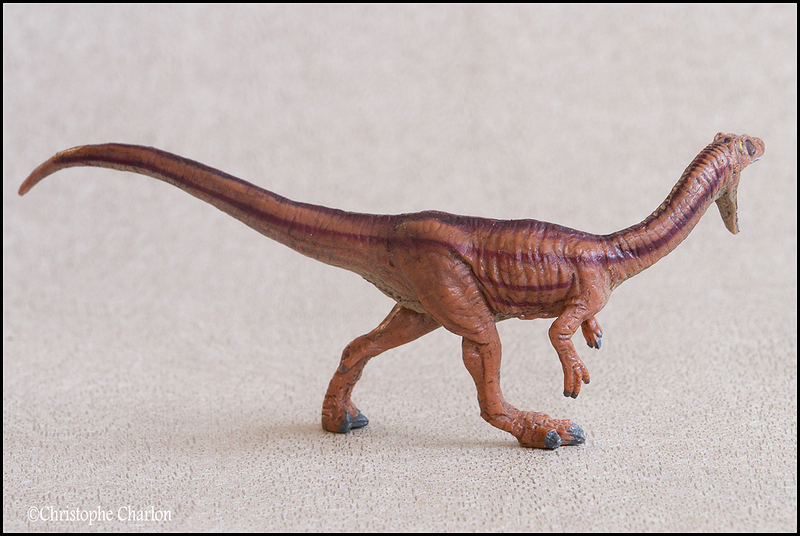 The two animals were common in what is now the southwestern United States. 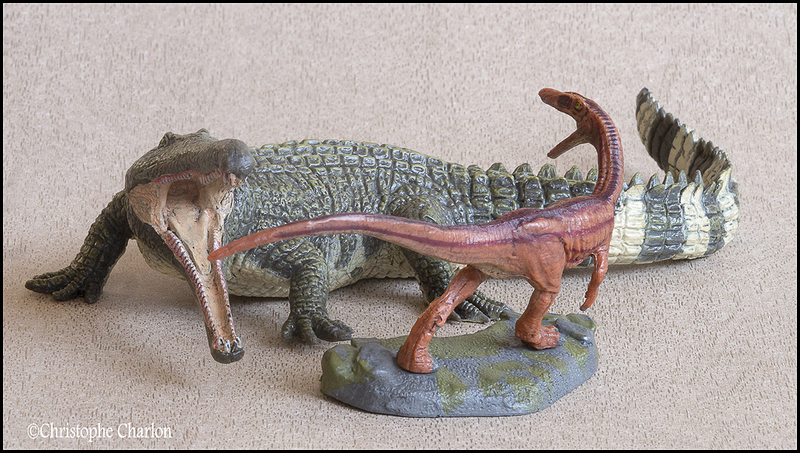 Both were predators and we can imagine Coelophysis eating Redondasaurus hachtlings while adult Phytosaurs made a nice snack of an adult coelophysis. 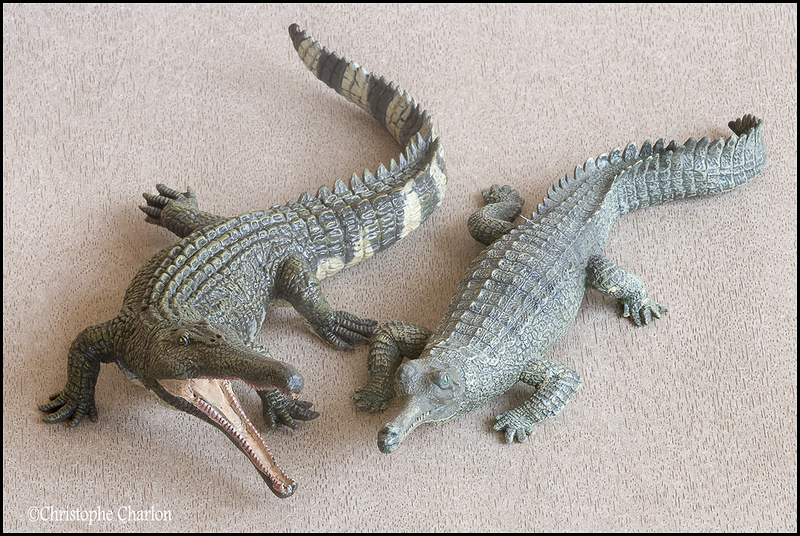 And now, ladies and gentlemen, it’s time to show you our two 1/25 scale dancers. 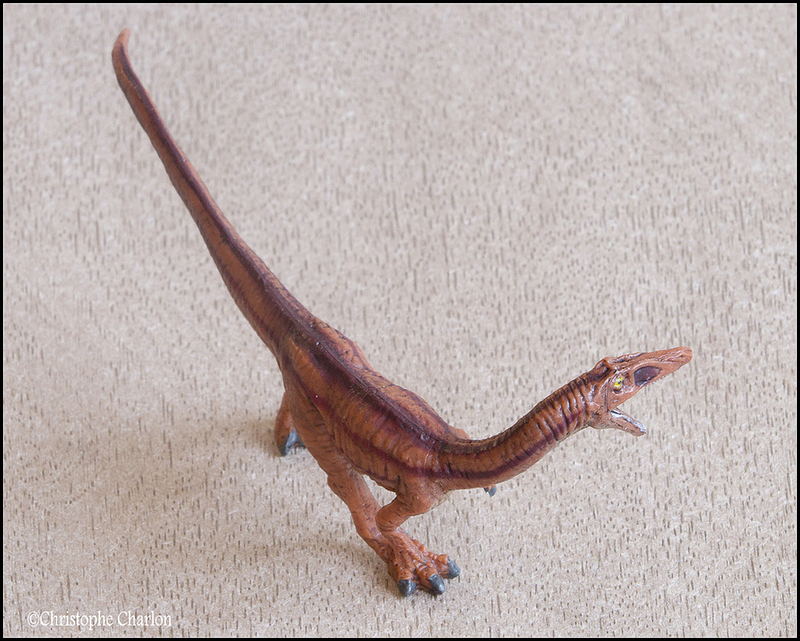 First the small Coelophysis. Kinto provide him a nice basis but it can also stand alone on his two feet. Christoph, you are making macaque - fun ....do we forgive you this awesome walkaround ? Models from your POOR collection ? Wow, very interesting models! This set is something completely new to me. The models are very well sculpted and the paintwork is great too. Also, fantastic walk around! Thank you for sharing the photos, Christophe! 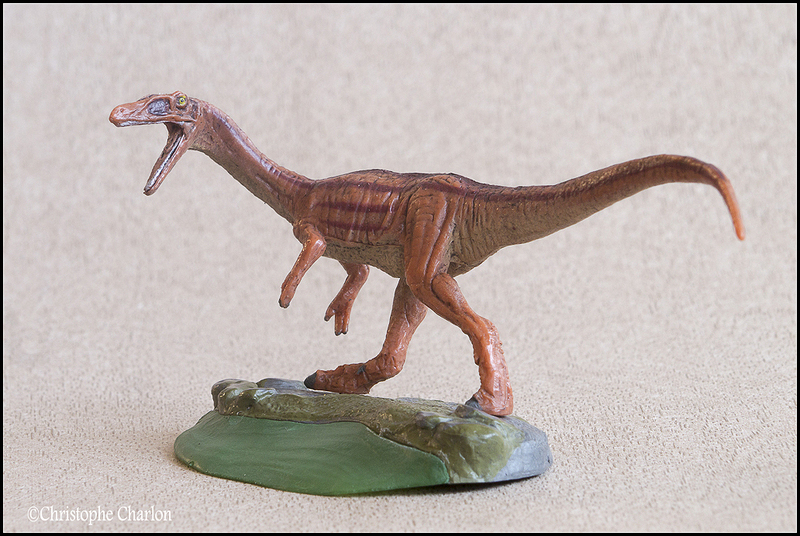 I have a bias for Kinto favorite Prehistoric models, too bad the wildlife are less good. I passed on it the first time around, but they have become available at a new Expo again. This time I will have Brett's source get me one. It's just so neat! I won't buy the other sets because I have to make choices but no doubt they are very interesting. Reading your reviews and watching your pictures bring always a big problem. We get, a uncontrolable will of getting these figures. The set is magnificent, the idea is genial and figures are excellent! 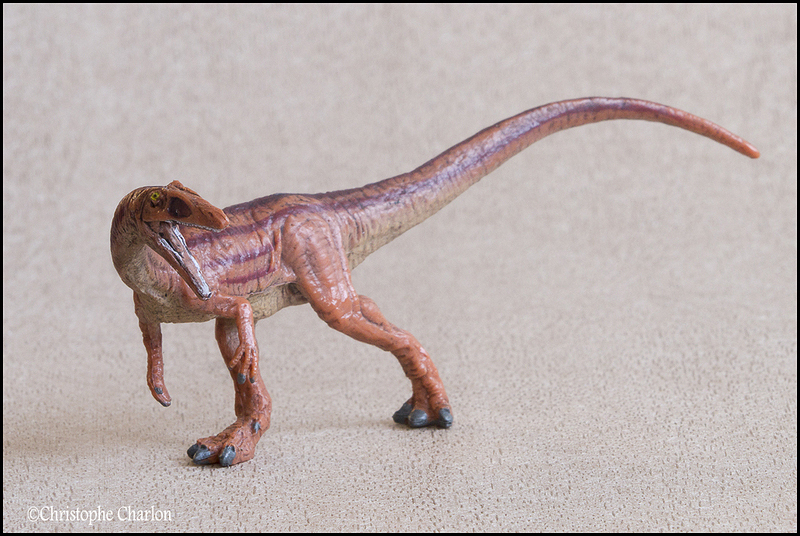 I love the delicate coelophysis but, obviously, the redondasaurus just kill me. 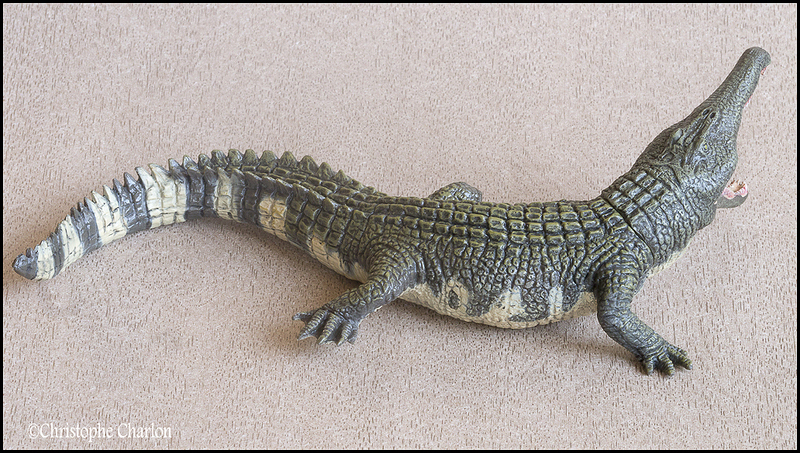 It is very detailed, very well painted, pose is perfect and it represents something that found the secret croc formula even if it is from an alternative way. Many thanks for showing pieces of such a high interest and quality. 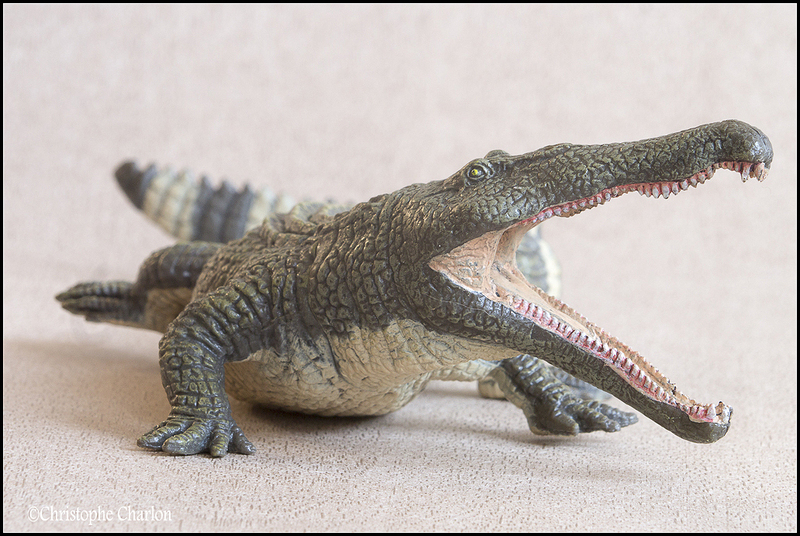 I recently got the new swimming spinosaurus in Favorite. 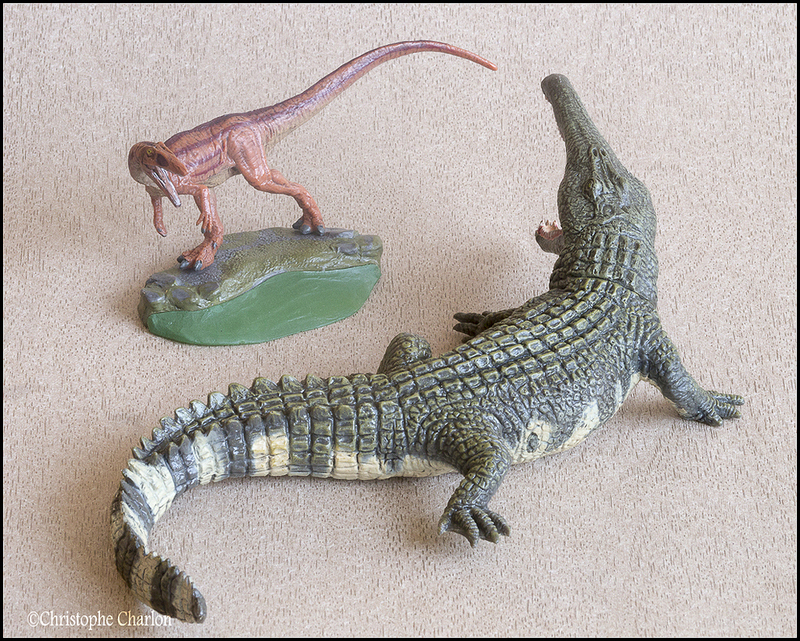 The sculpt and the choices of painting are great but the quality of painting was less good than for the other Favorite I have (there were some little scratchings on different parts of the body). I had to repaint them. 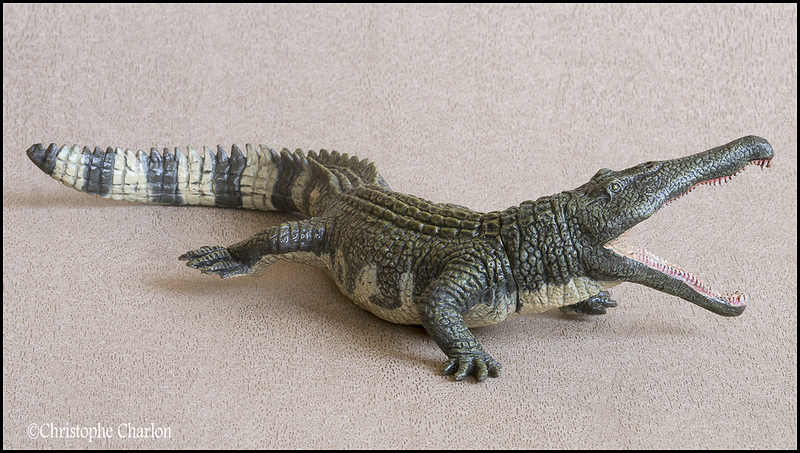 Too bad for your Spino I'm affraid mine could be like that too, I still don't have it in hands. About your spine, should I ask you to enjoy us with a walkaround? 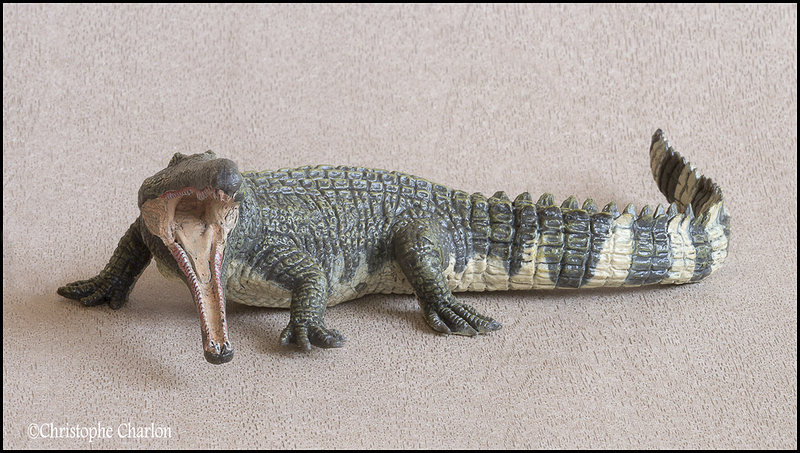 Of course, I'll share my pictures on the forum :) The scratchings were small and not important but it was mainly the spines' painting that overflows a little bit on the crest or the body's painting who overflows on the teeth. 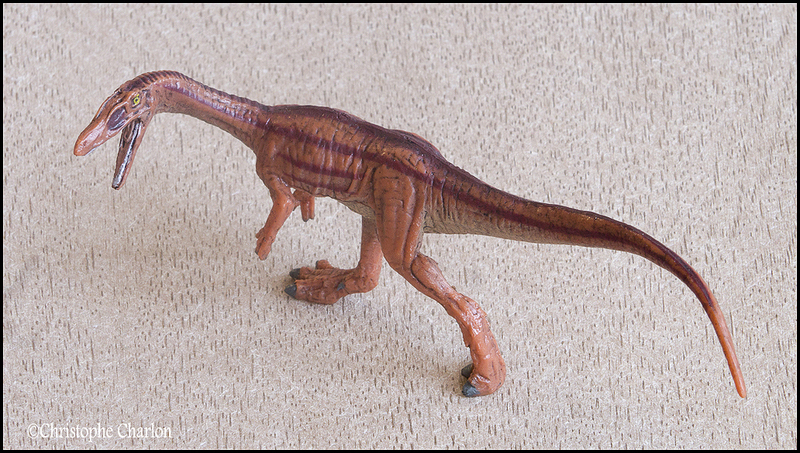 Ok, the Redondasaurus has the same flaws with its teeth. It is a step below for this otherwise excellent brand. i can't wait to watch your pics Florian. I see this redondasaurus and I feel trapped. Is great adqusition,I like him size and is very detailed. Your pictures,as usual, are Spectaculars.